Victorious! 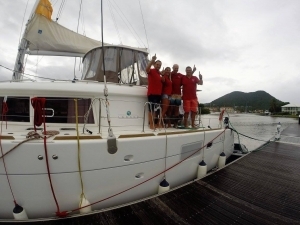 The British team of Hardy’s & crew triumphed with their fully-kitted Lagoon 450F at the ARC Atlantic Rally: 1st to arrive in St. Lucia. 55 knots – no problem! CLICK HERE TO SEE THE TRANSFORMED CHARTER FLEET OF LAGOON 450Fs AND HERE FOR THE NEW LEOPARD 38, 42 & NOW 46 PRODUCTION RUNS. 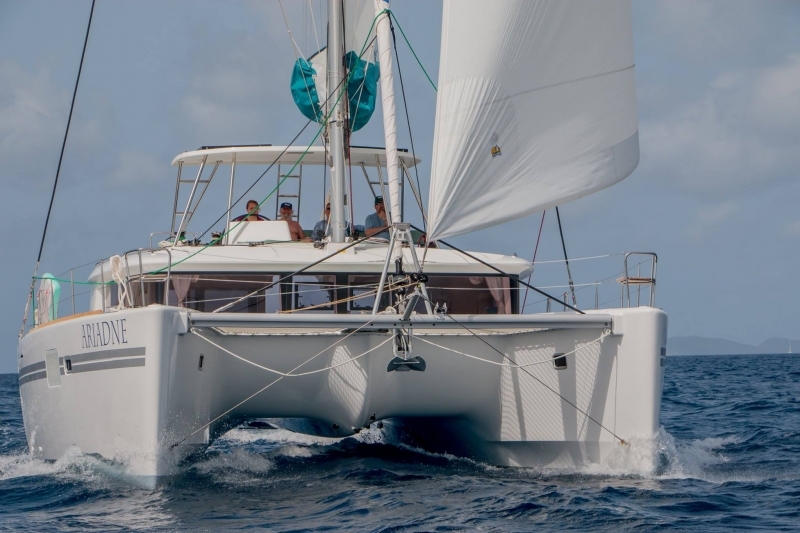 Experience the enhanced comfort and space provided by a Dedicated Marine Bimini Hardtop, expertly designed to complement the contours and lines of Leopard Catamarans & the Lagoon 380, 410, 440, 450 & 500. LATEST PROJECTS: Fountaine-Pajot Helia 44 & Lucia 40; Catana, Outremer and beyond just catamarans for solar & marine aftermarket requests. Wider coverage athwardship creates more space for weather protection for guests to comfortably sit with Helmsman; sailors will enjoy useful sturdy access to boom; LED lighting, Helmsman’s window and Handrails. Permits easy adaptation for shades, electronics, “green” technology: customers like the added space afforded for dodgers, speakers and electronics integration, as well as a perfect spot for solar panel mounting. Expertly constructed in appreciation of the original design of the boat. Transforms the Lagoon Flybridge into a “comfortable” skipper zone with 6’4” height clearance. 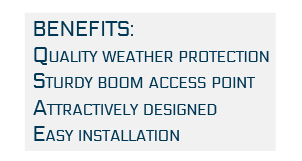 Only the highest quality materials are used in our composite constructed hard tops and associated products. 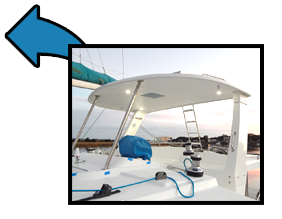 Our Bimini Hard Tops are easily shipped and have been delivered from our base in Florida to locations all over the US, the Caribbean, Europe & Asia. Straightforward instructions can allow for an easy self-installation. Not only to your time onboard but to the resale value of your boat. As seen with the increase in number of Hard Tops installed on the Leopard line, a premium is placed across the board on these boats.